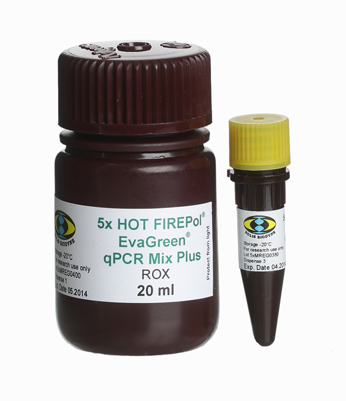 HOT FIREPol® EvaGreen® qPCR Mix Plus (ROX) is an optimised ready-to-use solution for real-time quantitative PCR assays, incorporating EvaGreen® dye. It comprises all the components necessary to perform qPCR: HOT FIREPol® DNA Polymerase, ultrapure dNTPs, MgCl2, EvaGreen® dye and ROX dye. The user simply needs to add water, template and primers. 08-24-00001 1 ml 5x PDF PDF PDF 37 EUR Login to buy! 08-24-00008 8 ml 5x PDF PDF PDF 280 EUR Login to buy! 08-24-00020 20 ml 5x PDF PDF PDF 640 EUR Login to buy! Shipping and temporary storage for up to 1 month at room temperature has no detrimental effects on the quality of HOT FIREPol® EvaGreen® qPCR Mix Plus (ROX). Applied BioSystems and ROX are trademarks of Applied Biosystems LLC, ViiA and QuantStudio are trademark of Life Technologies Corporation; Stratagene, MX3000P and MX3005P are trademarks of Stratagene Corporation.